Surrounded by museums and Central Park, this handsome structure is one of the city's nicest "white-brick," post-war apartment buildings. It occupies a prime site on Fifth Avenue directly north of the spectacular Solomon R. Guggenheim Museum. As a result, its long side-street facade has very dramatic views of the famous Frank Lloyd Wright museums curves and handsome modern addition as well as more privacy and Central Park views than most sidestreet exposures. It also benefits from being able to look at the very handsome building at 2 East 88th Street, which has one of the citys best watertank enclosures on the other side of the famous museum. This 21-story building, which was erected as a cooperative in 1961 and has 57 apartments. In addition to the landmark Guggenheim to the south, the National Academy is immediately adjacent in the very attractive former Archer Huntington mansion to the north and an wing of the National Academy just to the east on 89th Street. One block north, furthermore, is the impressive, fenced garden of the Cooper-Hewitt National Design Museum that was formerly the mansion of Andrew Carnegie after whom the Carnegie Hill neighborhood was named. This building has an attractive, canopied entrance with a doorman and a concierge and several terraces. It is close to many private schools and Madison Avenue has several attractive restaurants and a good supermarket nearby. In addition, the building is very convenient to the running track around the reservoir in Central Park, which has a major entrance at 90th Street. 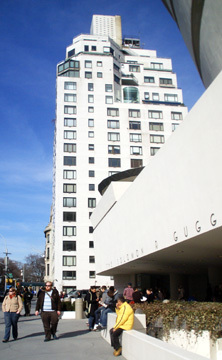 Although the Guggenheim museum generates considerable pedestrian traffic, this area is one of the quietest on Fifth Avenue as parades do not go further north than 86th Street and the Central Park transverse road entrances and exits are a few blocks away to the south. In 2009 a large curved window was added to a high terrace along the sidestreet.